I’m developing an awful habit of finishing Historical Sew Fortnightly challenges on time, and then running around like a mad chicken for two weeks before I have the opportunity to photograph them. 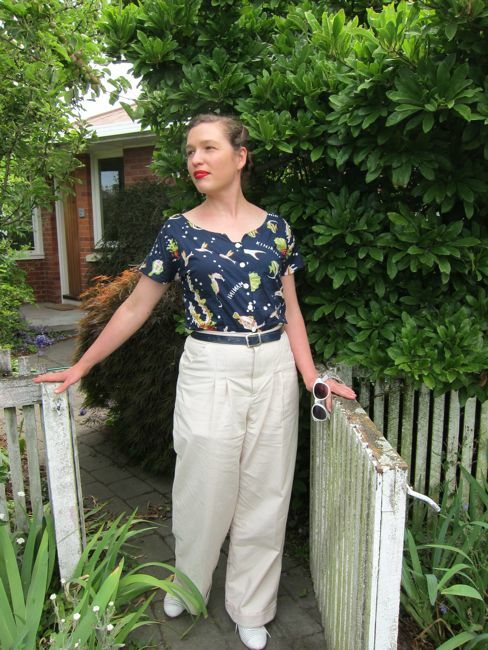 Case in point: my 1940s inspired ‘Hepburn in Hakatere’ trousers, for #23, the Modern History challenge. I put the last stitch in these trousers the evening of Saturday the 14th of December, after starting them in April and abandoning them for 8 months in my PHd pile when the weather got too chilly for light cotton trousers, and I ran out of steam. I wore them on Sunday (to great admiration and aplomb) for an end-of-year Baha’i children’s class barbecue, followed by the Wellington Sewing Bloggers it-was-supposed-to-be-a-picnic-but-the-weather-packed-in-at-the-critical-moment (and then of course fined up when it was too late to change) afternoon tea at my house. I had intended to get photos at either or both events, but I did the running-around-like-a-chicken thing instead. Farmyard avian insanity is also what happened to the rest of the week while I wrapped up my classes for the year and got everything sorted around the house so I could head off to spend a delicious, glorious week with the wonderful Lynne (you’ve met Lynne before. She’s the source of some of my wonderful textiles, and comments on the blog regularly) before Christmas. But I’m here in Hakatere with Lynne now, and there is nothing to do but sew and talk about textiles and take tea and wander round her garden, and it is heaven. And the wonderfully-wanderable garden is the perfect place to do photoshoots if we feel like exerting ourselves. So I played Katherine Hepburn does Land-Girl, and Lynne played photographer, and we had great fun. 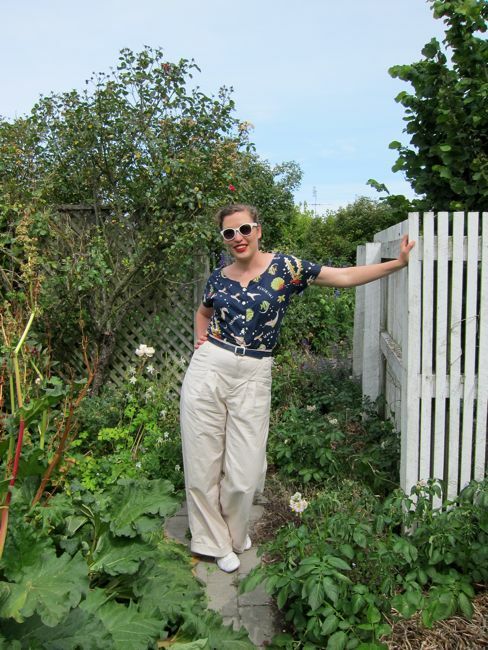 The pants are a hack of the fantastic Wearing History Smooth Sailing trousers. I’ve already customised the rise seams to fit me, as they are too short for my long rise and not-insignificant bottom, and I prefer a slightly more dropped rise anyway (and it is more period too), but this time I added pockets, a front placket zip, and changed the single inward facing pleat to double outward facing pleats, because I find them far more flattering on my figure. The result is something that I could live in all summer long: warm enough for cooler days, but light and fluid enough for really hot days. They go with practically everything in my wardrobe, and are SO COMFORTABLE. Also, the pockets are big enough to slip my camera and keys and wallet and a lipstick in, without creating an unsightly bulge. Can you say best thing ever? The fabric is a ecru and cream striped cotton, with a slightly ribbed effect. It has the massive virtue of being pale coloured but NOT see through, so I could be wearing hot pink with black and white polka dotted smalls for all anyone knows. Because I was using stripes, I had fun playing with horizontals and verticals on the pockets. You may also notice that the pleats are a slightly different length – I find a longer outer pleat and shorter inner pleat minimizes the stomach and lengthens the leg. 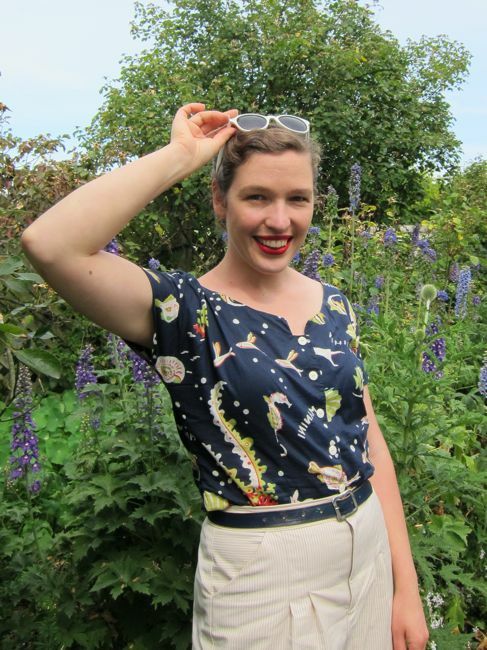 I’m wearing the trousers with my ‘Aloha Ka Manini‘ blouse, which is well overdue for a good photoshoot because its original blog post coincided with the first episode of ‘the Canon S100 is the most poorly designed, overpriced piece of crap camera known to man’. So yay! Good photos of the blouse! Pattern: I started with Wearing History’s Smooth Sailing Trousers, adjusted the fit, added pockets and a front zip, and changed the pleats. 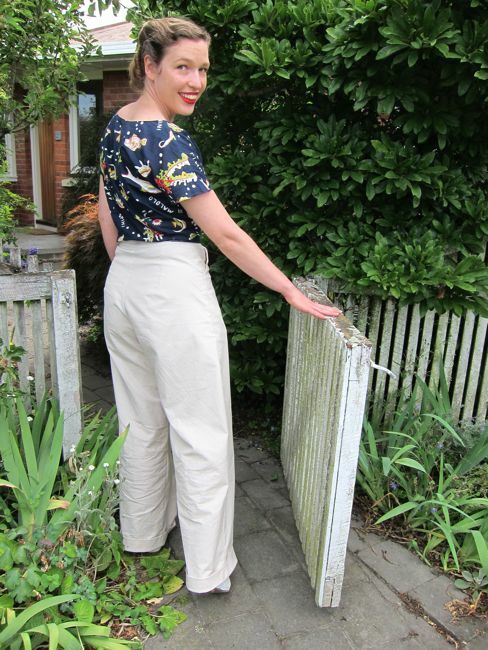 The result is a modern take on 1940s trousers. Notions: cotton thread, a metal zip, skirt hooks. How historically accurate is it? : It’s a modern take on a period look, but that’s OK for this challenge. Hours to complete: Around 8 altogether, including 3 spent trying to follow a tutorial for a placket zip which everyone has been raving about for making it so easy (why I bothered I don’t know. I’ve never found them hard) before giving up, unpicking it for the fourth time, and using the method I usually use. First worn: Sun Dec 15th, and as many days as I could get away with since then. Total cost: NZ$20 or so (and I think, if I’m very cunning, I have enough fabric left to make a pair of shorts from the same pattern in the same fabric). I love what you did with the pocket! Thank you! I wasn’t sure about the pocket, but I think I like it now. Have a lovely winter yourself, and I shall envy you again come your summer! How lovely! I’ve yet to photograph my #23 piece yet so don’t feel too bad! Thank you! I look forward to seeing our piece when it is done! Will it have a Florida backdrop? Fantastic! You look so very Hepburn….those trousers are just the Pant thing for you….and hurray for red lipstick! Thank you! 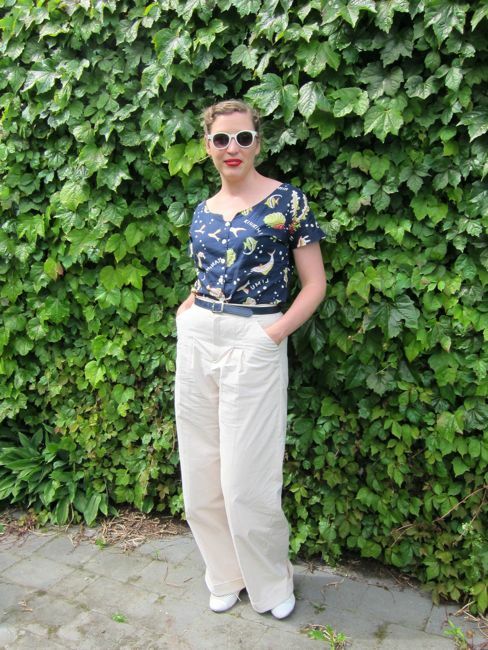 Hepburn pants are really my go-to trouser style, and red lipstick is my go-to ‘make any outfit fabulous’ finish! I think that’s very nearly enough to make me consider wearing trousers again! Thank you! They certainly make me like trousers enough to be willing to wear them even in summer when I could be wearing a dress! Thank you! 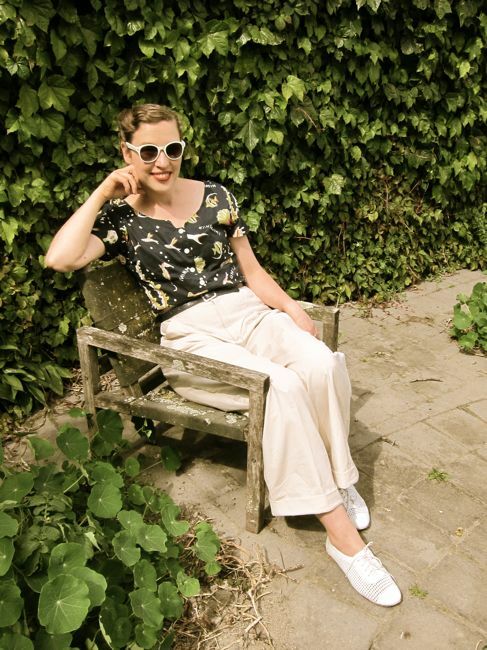 This is a really great pattern to start with (without the pockets and front zip) if you are nervous about sewing trousers – very easy and very well drafted. I can’t promise the pleat trick will work on every body, because there are so many variables – stomach fullness, length of pelvis, the orientation at which your legs leave your pelvis, thigh fullness and saddlebags, hip width and bottom size, etc, etc, but it works for my body! They’re lovely trousers. I must try your trick with the pleats; that’s clever.